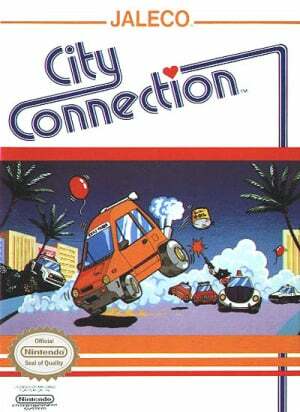 Originally released as an arcade game, City Connection puts you in the shoes of a man who wants to travel all over the world in order to paint its roads white, thus proving that he's travelled across the globe. Sounds like vandalism to us, but that's the '80s for you! Of course, this would be rather difficult to accomplish on foot, so you get to drive around in a car instead. 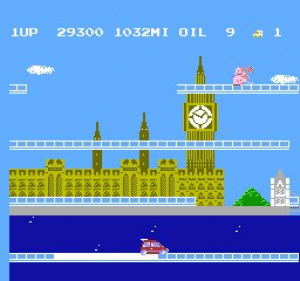 Inexplicably, most of the roads you must traverse are suspended in the air, and all of the game's cars have the ability to jump around between these completely disconnected roads. Your goal in every level is to drive across every single piece of road, while avoiding the cop cars and other obstacles, like cats; you can also opt to shoot cop cars with barrels of oil, but you only have a limited supply of ammo, so use it wisely. Each level has quite a bit of ground to cover, so it can take a while to finish even one, especially with all the dodging you have to do. The roads are also actually split up into small tiles, meaning you'll only paint very small sections at a time - getting the ones at either ends of a flying section will generally cause you to fall off (potentially hitting something below) unless you hit jump at the very last moment. Annoyingly, you can't simply jump up through each platform like in so many other games from around the same time, so you'll have to jump up onto each from the sides - your car only just jumps high enough to reach, as well, so the timing for this can be very tricky to master. All in all, there are seven different locales, after which the game, like most arcade titles, will start looping, albeit with slightly different level layouts. Of course this means there's no real ending, so from this point you just keep playing until you lose all your lives. Every location having its own background is quite nice, but unfortunately the same can not be said about the music. Every level also has its own song, but most of them are quite annoying and will loop very frequently, meaning they're quite likely to get on your nerves. City Connection was a decent enough game in arcades, with more levels and better music, but unfortunately its NES port doesn't do it much justice. Completing every level is a chore, and having to waste time dodging the random obstacles and trying to do near perfect jumps to higher areas doesn't exactly help matters; on top of that, there's grating music playing at all times. If you really have to experience this title, try to find the arcade original, otherwise it would be wise to skip it. Who in the world chooses the VC games at Nintendo for the Eshop? Common Man! Why would Nintendo choose to release this? Hamster, the publisher for the game, would have approached Nintendo and said "release this game on 3DS" and Nintendo said "sure, whatever". Blame Hamster. Nintendo would not have been able to release this if Hamster hadn't approached them. I can't say I've ever found anything more frustrating, video games related, than Nintendo's Virtual Console. Seriously Nintendo. I love you, but you make some baffling, incredibly sh**ty decisions. Jaleco... That explains a lot. I remember this was one of the first games I rented when I first got my NES back in 1985. I rented it cause from the picture on the box I thought it was a racing game boy was I wrong. I played if for a few hours then took it back to the video store I haven't played it since nor will I. One of the worst games to come out on the NES. @Mikau94 And what exactly does it explain? If you're born in 1994 (guessing from your user name) I guess you haven't really had that much contact with Jaleco games, right? It's in no way a bad company. @Mikau94: Yeah don't hate on Jaleco! I am with you, KnightRider666. I grew up on this game as an NES kid and I was hoping someday it'd arrive! I want to own all my original NES games on the 3DS, so I am still hoping to see someday Bases Loaded also! I downloaded River City Ransom this week and I'm in heaven! I was around when the NES was new (though I didn't play games much until I got an SNES after release). Didn't play many Jaleco games then. 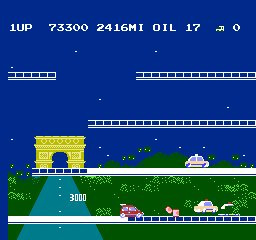 But years later I did try a lot of Jaleco games, and I'd say they definitely ran from UGH (Urusei Yatsura Famicom) to okay (RodLand. Probably the best I played with Super Ninja-kun, which was nice but no Super Mario World). Not a bad company, but not great. I don't hate Jaleco, but growing they were always "the company that made too many baseball games." but their NES end labels drove me nuts as well. They have a bunch of great games; Earth Defense Force was one of my first SNES games and I loved Avenging Spirit. I may be too young to remember the NES and SNES eras but some of my all time favorite games were made for those condoles. @Magrane: Definitely! I hope they really start giving us some obscure NES games for the 3DS VC. Panic Restuarant anybody?